Giovanni Visconti (Movistar) presented his component sponsor Campagnolo an eightieth anniversary present as he soloed to his second victory of the 2013 Giro d’Italia in the 17th stage, between Caravaggio and Campagnolo’s hometown of Vicenza. The 30-year-old Italian, who had won stage 15 just three days before, escaped over the only obstacle of the day, the 4th category climb to Crosara, with just 17km to go, and managed to hold off the disjointed chase of the fractured peloton behind him. 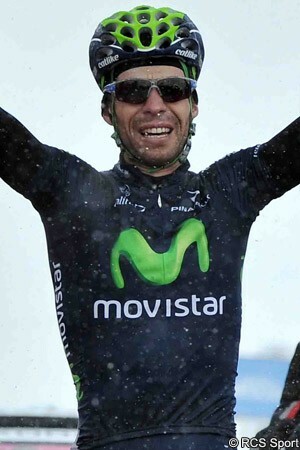 With just 32 seconds lead over the top of the climb Visconti managed to hold on to win by 19 seconds, taking, not only his own second stage, but the fourth for Movistar, and the team’s third consecutive victory. Stage 11 winner Ramunas Navardauskas (Garmin-Sharp) led the chasing peloton across the line, celebrating as though he had taken a second victory himself, with Luka Mezgec (Argos-Shimano) sprinting to third. “Before the Galibier stage [which he won - ed] I had earmarked the Ivrea and Vicenza stages,” said Visconti after the stage. “At Ivrea [the previous day - ed] I finished close to the GC riders, even though I was tired after the Galibier, so I thought of today. “The team was thinking of Ventoso and me,” Visconti added. “I decided to try my luck on the climb, and leave the sprint to Ventoso. The mostly flat 214km stage saw an attack from Australian champion Luke Durbridge (Orica-GreenEdge), Miguel Angel Rubiano (Androni Giocattoli-Venezuela), Gert Dockx (Lotto-Belisol) and Maxim Belkov (Katusha), who escaped in the very first kilometres. The group’s lead fluctuated around three minutes for much of the day, but was to peak at more than five minutes just after half way, before the sprinters’ teams began to pull it back. The four-man group split on the Crosara climb with Rubiano the last rider remaining. With the peloton just half a minute behind, the Colombian was joined first by an attacking Danilo Di Luca (Vini Fantini-Selle Italia), and then by Visconti. Visconti the accelerated again, which dropped Di Luca, and a second kick got rid of Rubiano just before he reached the top. “I saw Di Luca and Rubiano ahead,”said Visconti. “I caught them, and dropped them on the climb. I dropped Rubiano because he is fast in the sprint. Then I just gave it full gas on the descent and flat. The much-reduced peloton failed to organise a cohesive chase behind Visconti on the descent, or on the flat run into Vicenza that followed. Several riders tried to escape on the way to the finish, but Visconti was able to hold on to take his second stage. Maglia Rosa Vincenzo Nibali (Astana) was able to spend a relatively quiet day in the peloton and, despite a number of attacks from some of his overall rivals in the closing kilometres, finished the day with his overall lead unchanged. Following some tough days, the 17th stage was identified as a likely one for the sprinters, given its mostly flat profile. The late climb to Crosara would complicate matters, however, just as a similarly late climb had done the day before, while - with Campagnolo celebrating its eightieth anniversary in Vicenza that morning - riders using the company’s components and wheels would be extra keen to perform. Durbridge, Rubiano, Dockx and Belkov escaped in the first kilometres of the stage and, as the peloton relaxed behind them, were 4’40” ahead after just 13km. Omega Pharma-Quick Step then took control of the peloton and gradually reduced the deficit until, with 90km to go, it was down to just 2’11”. As the Belgian team began to look at the others to lend a hand, however, the gap grew to more than five minutes before Cannondale, Argos-Shimano and Movistar moved up to join the chase. Belkov led through the Traguardo Volante sprint, in San Bonifacio with 63.7km to go, with Omega Pharma-Quick Step’s Mark Cavendish leading the peloton through 4’23” later. This was repeated at the second Traguardo Volante, in Orgiano with 42km to go, but this time the gap was down to just 2’49”. Blanco and BMC Racing then began surging forward, which caused the speed in the peloton to rise, and the gap was cut to just 1’05” and, as the break hit the late, rolling part of the course with just 30km to go. Belkov was almost immediately dropped by the other three and drifted back to the peloton. The pace of the peloton dropped a little as it began to hit the succession of small, uncategorised climbs, and saw the gap to the break increase a little. Vini Fantini-Selle Italia moved forward, however, and cut it down to 1’01” as they passed under the 25km to go banner. The gap was static as the three-man break hit the foot of the climb to Crosara but, as Rubiano pushed on, Dockx - who had been struggling a little on the previous climbs - was left behind. Vini Fantini-Selle Italia duo Alessandro Proni and Di Luca then attacked together and the Omega Pharma-Quick Step team watched the two Italians go. Up ahead Rubiano accelerated again, which also saw Durbridge dropped. Proni peeled off and allowed Di Luca to go, but the Lampre-Merida team was leading the chase not far behind him. The 2007 Giro winner soon passed Dockx as the Belgian drifted backwards, then breezed past Durbridge shortly afterwards, but Lampre-Merida still had him in sight as he hunted down Rubiano ahead of him. With 20km to go Rubiano was 22 seconds ahead of Di Luca, with the top of the climb still three kilometres away. The peloton was just eight seconds behind the Vini Fantini-Selle Italia rider, and shedding several riders. Mark Cavendish was struggling to stay on contact, but was drifting backwards as his teammates surrounded him. Di Luca caught up with Rubiano with 19.5km to go, just as Visconti jumped clear of the peloton, and the stage 15 winner took less than half a kilometre to make it across the gap. After a brief rest in the wheels, Visconti attacked again; Rubiano went with the Movistar rider, but Di Luca was unable to follow. Lampre-Merida was still leading the much-reduced Maglia Rosa group, and was just 25 seconds as the two leaders approached the top of the climb. Seeing that Rubiano was tiring Visconti attacked again with less than half a kilometre to climb, and was alone as he crossed the line at the top. Rubiano was 16 seconds behind as he followed over the line, with the peloton - having caught Di Luca - was at 32 seconds as Tanel Kangert (Astana) led the way. A minute behind the peloton, Mark Cavendish was being paced by four of his teammates as they fought to get the Manxman back in time for the sprint. Rubiano was caught up by the peloton with 12km to go, but Visconti’s lead was inching a little wider on the fast, winding descent. As the roads began to flatten in the final ten kilometres Visconti was 33 seconds ahead, but Bardiani-CSF leading the chase. As the peloton eased up under the ten kilometre banner a number of riders began to attack off the front, with Valerio Agnoli (Astana) and Italian champion Franco Pellizotto (Androni Giocattoli-Venezuala) among those trying to escape. Wilco Kelderman (Blanco) managed to get a few seconds clear with nine kilometres to go, but the Dutchman was swept up a kilometre later. Fabio Felline (Androni Giocattoli-Venezuela) was the next to try, but he was only able to get a few metres clear before being swept up again. Visconti’s lead was reducing very slightly under the impetus of the attacks, but the Movistar rider still had 22 seconds with six kilometres to go. Jorge Azanza (Euskaltel-Euskadi) then tried to attack, with Pellizotti jumping across to him, but nobody was being allowed to get away. The lack of cohesion in the group meant that Visconti was now increasing his lead a little, taking it up to 24 seconds as he entered the final four kilometres. Robert Gesink (Blanco) and Rafal Majka (Saxo-Tinkoff) managed to get a little clear, but they too were chased down before they could get far. Into the outskirts of Vicenza with two kilometres to go Visconti still had 20 seconds, as he almost slid off on a tight left hand corner. Carlos Betancur (AG2R La Mondiale) then punctured, dropping out of the chase group, but should be assured of the same time as the group. Into the final kilometre Visconti began to look over his shoulder, but there was no sign of the chasers and, as he pulled into the finishing straight he had time to do up his zip and sit up to take his second stage victory of the race, looking up to the sky as he did so. Navardauskas burst ahead to take the bunch sprint, appearing to think he’d taken a second stage himself, with Mezgec just behind him in third.